Sharing my thoughts, notes and questions is what this blog all about. Reviews for products, movies, music and politics will be reviewed here all the time. I called my one and only nephew Kuya. His name is Gino Paulo. 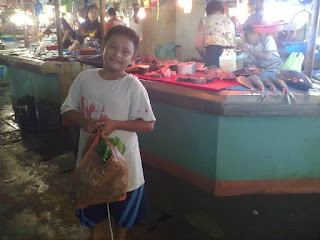 I remember when he was a bit young (3 or 3 yrs old) every time I go to the market early in the morning he woke up like he is watching me the whole time I am preparing to go to the market. So he became my buddy2x. Now he is 12 years old and my brother is now asking him to go to the market. As you see in this photo he is in the fish section of the market and he is carrying a bag that contains vegetables and I bet fishes too. I really love this photo because it just shows and reminds me when he was young that the he likes to tag along with me where ever I go. Now he can do marketing but one thing that my brother told me is that there are some young kids like his age or older than him that are bullies. And my brother is afraid that he will be bullied because he is the type of a boy that don't like quarrel and is a loving kid. That is the only concern my brother is when he goes to the market the bullies that's why sometimes he goes with my Kuya just to look out for him, since my brother is a cop! promiscuity issue ang nakakatakot sa mga westernized kids, sabagay dito din nman, teeners thought they can get away with evrything.me and the hubs would always talk to them. When we hear Barn what comes in our mind is red but some barns are not but the equipment around are red, see it for yourself. Can you find it? 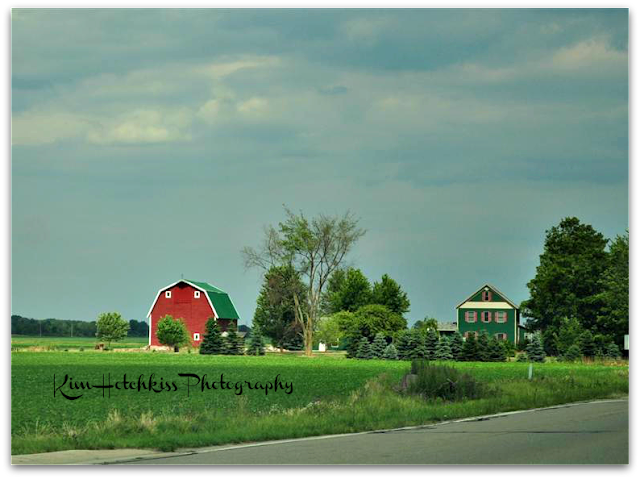 Two different barns but both are charming. A pretty charming and colorful house with the barn. I saw this last month on the way to Grand Rapids, MI.